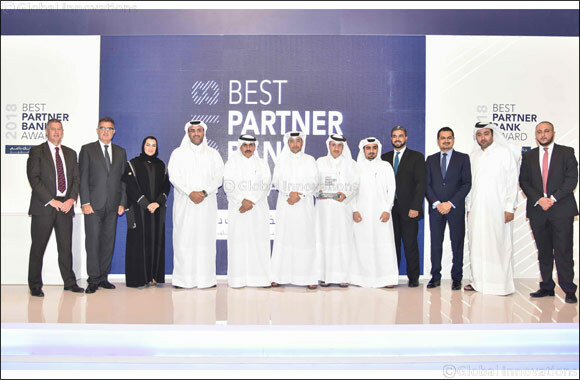 Doha, September 4, 2018: Al Khalij Commercial Bank (al khaliji) P.Q.S.C., Qatar’s next generation bank, in recognition of its relentless support to local entrepreneurs and Small and Medium Enterprises (SMEs) in the country, for the second consecutive time won “Al Dhameen Best Customer Satisfaction Award” for 2018 by Qatar Development Bank (QDB). al khaliji claimed the coveted title following its short-listing for the award, along with other high profile financial institutions, during a gala dinner ceremony that was recently held at Rotana City Center Hotel, in the presence of the Governor of Qatar Central Bank HE Sheikh Abdulla Bin Saoud Al-Thani, QDB Executive Director of Business Finance Mr. Khalid Abdulla Al Mana, Al Dhameen Manager Ms. Jawaher Humaid Al Noaimi and VIP guests. Al Dhameen is an indirect loan facility established by QDB to guarantee commercial bank loans to private sector companies, as a way of assisting SMEs that show components of success with limited credit history or lack of collateral to obtain access to funds, for establishing or growing their businesses. The program supports businesses in the Manufacturing, Education, Tourism, and Healthcare sectors in launching their SME ventures, while effectively contributing to the realization of the Qatar National Vision 2030 through investing in the country’s economic growth and diversification. The Award garnered by al khaliji reaffirms the Bank’s commitment to supporting local SMEs and innovative entrepreneurs in Qatar, as part of its broader efforts to effectively contribute to the economic diversification of the country, by blending tradition with innovation in order to meet the needs of both this generation and future generations of employees, customers, investors and business partners.